The cost of a Trex deck typically runs from $9 to $16 per square foot. Of course, that depends on where you're buying it, and how much you’re purchasing. Visit our Cost Calculator for a customized estimate. WHY ARE TREX OUTDOOR LIVING PRODUCTS BETTER THAN WOOD? When it comes to Trex vs. wood, there's more to the story than the upfront price. While wood may be cheaper on day one, it could end up costing you far more by day 365 (and well beyond). Trex means quality, beauty and minimal maintenance, saving you time, money and everything that comes with a call to the handyman. Plus, the high-performance composite shell of Trex decking resists rotting, staining and cracking. WHICH TYPE OF DECKING DO I OWN? Please refer to the Decking and Railing section of this FAQ for details on all of our product lines, and to explore the difference between our early-generation and newer-generation decking. 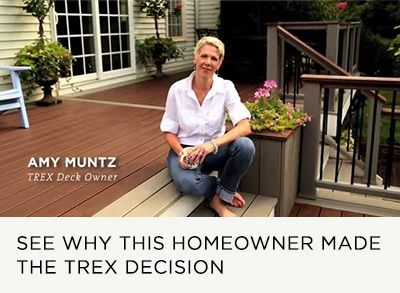 Unsure if your deck is made with Trex? Start by reviewing our decking product lines to compare your decking against our collection. If you're still unsure, contact us over the phone. HOW DO I CLEAN MY TREX DECK? Trex decking is designed for a low-maintenance experience. A simple soap-and-water clean is all it takes. For more details, refer to our Care and Cleaning section. HOW DO I INSTALL MY TREX PRODUCT? Our installation guide has you covered. And take a look through our YouTube channel for more tricks and tips along the way. Why is Trex® decking better than wood? If Trex is made from recycled materials, why is it more expensive than wood? How can I tell if I have early-generation or newer-generation decking? Trex products offer superior durability and performance that you can't get from wood. Trex decking resists termites, won't rot, warp, or splinter-and never needs staining or painting. What's more, Trex decking is made from 95% recycled materials: That's an eco-friendly decking choice you can feel great about. To learn more please review our Trex vs. Wood page. While most of the raw materials used in making Trex are recycled, these materials are carefully processed to ensure the highest level of quality and performance. The end result is decking that performs better than wood, lowering your cost over time through lesser maintenance. To learn more please review our Always Green page. With pressure-treated wood decks, maintenance costs add up over time. Although Trex costs more initially, you'll never have to sand, stain or paint your Trex deck. Over the life of your deck, those reduced maintenance costs add up to a greater value than wood—not to mention the value of the added time spent enjoying your deck rather than working on it. If you've noticed any staining, scratching or fading over the years, it's likely you have early-generation decking. While our early-generation decking was groundbreaking for its time, spills and scuffs can still leave a mark. Newer-generation decking is easy to spot because of its resilience. Today's Trex decks resist blemishes with an innovative, high-performance shell that wraps around three sides of our deck boards. Early-generation composite decking (Trex Origins®, Trex Accents®, Trex Profiles®, Trex Brasilia® and Trex Contours®) represented a breakthrough for low-maintenance and durability. While wood decking inevitably suffered splinters, warping and rotting, and required considerable maintenance, early-generation Trex never had to be stained and did not rot, warp or twist like wood. Periodic cleanings with a composite deck cleaner were far easier than the dreaded sanding and staining required to maintain wood decks. As the category evolved, this early-generation composite was offered in additional colors and with grain patterns that reflected a more natural appearance. Even so, all early generation wood-plastic composites, whether Trex or a competitor's product, were not stain, scratch or mold-free, and did fade slightly in color as they naturally weathered. To address these issues, Trex introduced a new kind of high-performance decking in 2010. 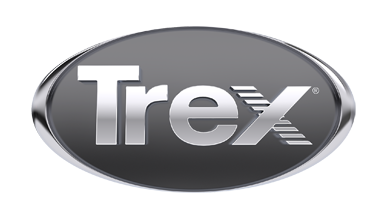 As of 2014, Trex no longer manufactures any early-generation composite decking. You can find Trex decking samples a number of ways. At shop.trex.com, you can order 12-inch samples of Trex decking in every color. Samples are $5 each, including tax and shipping, and will be delivered to your door. You also can find 3 1/2-inch decking samples free of charge at selected local Trex dealers and retailers and through your local TrexPro® contractor. Does Trex fade or change color? Does Trex decking get hotter than pressure-treated wood under the sun? Can I build a firepit on my Trex deck? Can I place rugs on my Trex deck? [BEST] Trex Transcend® decking offers the broadest range of decking colors and finishes (including five Earth Tones and five Tropicals). Engineered with a proprietary shell technology that protects against fading, staining, scratching, mold and mildew, Transcend decking offers elevated aesthetics paired with the highest level of performance. Plus, Transcend deck boards offer the beauty of exotic wood—without the environmental strain of harvesting endangered forests. [BETTER] Our Trex Select® Earth Tones and Trex Enhance® Naturals collections both offer high performance in five versatile colors. No matter which you choose, their fade and stain protections as well as enhanced mold and mildew resistance make maintenance simple. The question then becomes: what hue suits you? If a classic solid is your style, Select Earth Tones deliver rich, opaque color to your yard. The perfect pairing of price and minimal maintenance, Select is a simple choice, particularly if you want a composite board with a profile that not only resembles traditional lumber, but can also be used as cocktail railing. For a multi-tonal look, opt for Enhance Naturals. With its nature-inspired, authentic wood-grain appearance and lightweight, scalloped profile for simple handling, this collection offers the beauty of wood with the ease of composite. Note: Select boards are slightly thinner than all Transcend and Enhance decking; to avoid tripping hazards, these collections should not be combined. [GOOD] Trex Enhance® Basics meld the durability of composite with the affordability of wood, resulting in long-lasting, worry-free decking. Trex Enhance Basics decking comes in three traditional colors, and because the boards are scalloped, they’re lightweight for easy handling. [BEST] Trex® Signature™ aluminum railing offers minimalist style with maximum strength. Trex® Signature™ also performs equally well for residential or commercial settings. What's more, aluminum is a 100% recyclable and renewable resource and Trex® Signature™ is backed by the Trex® Signature™/Reveal Limited Warranty. [BETTER] Trex® Transcend railing offers nearly limitless opportunities to mix and match profiles and colors for a customized look. Our highest-performance railing option offers more colors in more component profiles than any railing out there. [GOOD] Trex Select® railing is our simplest and most affordable high-performance system. The Classic White rails and Charcoal Black balusters of Trex Select can also mix and match with different colors of Trex post sleeves, post sleeve caps and post sleeve skirts. How well your Trex deck endures Mother Nature depends upon what type of Trex you have. Early generation composite decks - such as Trex Accents®, Trex Origins®, Trex Profiles®, Trex Brasilia® and Trex Contours® - do not have the high-performance shell with enhanced fade, stain and mold resistance. As such, these traditional composites will fade naturally over time, achieving their weathered color after 12-16 weeks. For Natural Weathering Information, click here. Newer generation high-performance composites - Trex Transcend®, Trex Enhance® and Trex Select® - have the protective shell technology that provides superior fade and stain resistance. Trex decking does not typically get hotter than pressure-treated wood, although on a hot day with a blazing sun, nearly any surface will get uncomfortably hot. Lighter colored boards tend to be slightly cooler than darker composite boards. In extensive studies, it has been found that the color of the decking board, regardless if it's made of wood-plastic composite or wood is the most significant factor in the "heat retention" of the board. In these studies, pressure-treated wood stained the same color as Trex was actually hotter than Trex in the same test conditions. The cost of a Trex deck typically runs from $9 to $16 per square foot. As with many things in life, you get what you pay for. Initially, Trex decking and railing does cost more, board for board, than wood decking and railing. However, the payoff you get over time in decreased maintenance costs and increased leisure time provides compelling value-so much so, that you'll often see Trex decks referenced in the listings of homes for sale as an indicator of quality and value that homeowners and real estate agents tout when selling a home. Of course, the real value is in the time that you enjoy spending outdoors on your Trex deck. Our Cost Calculator will have your closest estimate for materials costs. The breadth of the Trex lineup means that there are Trex products to suit nearly any residential or commercial need. Trex decking is widely used in commercial and public projects throughout the U.S. and around the world, ranging from a landing at Mt. Rushmore and a resort in Dubai, to a pier in Philadelphia and New Jersey-shore boardwalks replacing those destroyed by Hurricane Sandy. Of course, Trex is more than just decking. Trex Elevations® steel deck framing often provides the support beneath commercial projects, ranging from lakeside paths on a college campus in Utah to a large rooftop swimming pool and sundeck in the middle of Manhattan. The sleek profile of Trex Signature® railing works as well for commercial and multi-unit residential complexes as it does for your own backyard, while Trex Outdoor Furniture™ can be found in many coastal resorts under Trex Pergola™ installations. All Trex products, when properly installed for approved applications, are either code compliant or are undergoing rigorous code compliance review for the International Residential Code (IRC) and/or the International Building Code (IBC). Check with your local building code department for jurisdictional requirements. Trex wood plastic composite products are not structural and should only be used for intended design purposes such as walking surfaces, guardrail systems, fencing and trim; however, Trex Elevations steel deck framing is a code-approved structural product (CCRR-0186). Nothing is more important than your safety outdoors. At Trex, we do everything we can to ensure it. Our Transcend and Select decking lines retain a Class B fire rating, while our Enhance decking lines retain a Class C fire rating; however, they are not fireproof. Moreover, our substructure product, Trex Elevations®, retains a class 1A fire rating. Wood or gas fire pits should not be placed on top of Trex decking. However, gas fire pits may be installed beside or between deck boards with a protective wall made of stone or other fire-resistant material used for insulation. Wood burning fire pits should not be placed on top of Trex decking unless installed with DeckProtect™, a product designed to temper extreme heat and loose embers. For more information, please visit their website. Most area rugs aren't a problem with Trex decking, but we do recommend cleaning underneath them regularly. In rare cases, rugs made of plastic or viscose materials may bleed, drawing colorant out of the decking or making them difficult to remove. Always allow your decking to fully dry before fitting a rug into place. Dramatic curves are a hallmark of Trex decking and railing. All Trex Transcend® composite decking and composite railing can be curved using the Trex CustomCurve® system and still be covered by the Trex warranty. And the precise engineering of Trex Elevations steel deck framing makes the perfect canvas for curved Trex decking. Additionally, Trex® Signature™ aluminum railing can be curved to match staircases, bump-outs and nearly any custom perimeter. Our search filters can help you find a builder who works with curved decking and railing in your area. Yes, a groove can be cut in the side of Trex decking by using our Trex Groove Cutter to accept our recommended hidden fasteners, a system that enables deck installation without visible screw heads on the walking surface. More conveniently, Trex decking is also available in pre-grooved profiles, ready to install with our Trex Hideaway® Hidden Fastening System. Glue cannot be used as a primary fastener for Trex decking. When using Trex Fascia, glue can be used as a secondary fastener-see Fascia instructions in the Installation Guide for more details Installation Guide for more details. The unyielding shell of our high-performance decking—Trex Transcend, Trex Enhance and Trex Select—means it never needs painting or staining. The rich color and protective finish are engineered right into the shell, and the shell is designed to remain free of rotting, splitting, splintering and insect damage for 25 years. Not to mention, painting Trex decking may void your warranty. Can I use Trex® RainEscape® with Trex Elevations®? Building a brand new deck from the bottom up is the perfect time to consider the below-deck water drainage product RainEscape, a system of flexible channels that easily works in concert with our Elevations steel deck framing system or with a wood substructure. Please refer to RainEscape for more information. Why is Trex Elevations better than wood deck framing? Does Trex Elevations cost more than pressure-treated wood deck framing? Can Elevations steel deck framing be used in high fire danger areas? Can I build a dock out of Elevations? Trex Elevations is a revolutionary steel deck framing system that provides a stronger, straighter, safer and smarter foundation for Trex high-performance decking and railing products. Dimensionally stable steel provides consistency and reliability that wood doesn't, and is more fire-resistant as well. Leveraging the strength of steel, Elevations can span longer distances between posts and precise engineering ensures surfaces that remain flat over time. Trex Elevations leverages the strength and dimensional stability of steel to create a flat surface for the decking above. Wood, on the other hand, often has inconsistent dimensions and can warp or twist over time. Those imperfections below can be amplified to the decking above. Simply put, high-performance decking deserves a high-performance deck frame. In most cases, individual Elevations' components cost more than pressure-treated wood components. The Elevations steel deck framing system does offer efficiencies not found with wood, including the ability to build longer spans and extend cantilevers with Elevations joists and beams. In addition, Elevations joists are now available in one-foot increment lengths, requiring fewer materials overall. Elevations also comes with a 25-year limited residential warranty, making it a smart investment. Elevations components are non-combustible, carry a Class 1A fire rating and can be used for extreme wildfire building areas such as Wildland Urban Interface (WUI) areas. Due to increased risk of corrosion, do not install Elevations within 3,000 feet (.6 miles) of any body of saltwater or under the surface or within the splash zone of any body of fresh water. Any such installation will void the limited warranty. Yes. Trex Elevations is CCRR-1086 compliant. Is Trex decking scratch resistant? How can I clean my Trex Tanscend or Trex Select railing? Trex high-performance decking (Trex Transcend, Trex Enhance and Trex Select) can be power washed. Use only a fan tip and up to a 3100 psi power washer to remove dirt and debris. The fan tip should be no closer than 8 inches (20.4 cm) away from the protective shell during use. Trex decking requires far lower maintenance than wood decking, but does require some maintenance to keep it looking good throughout the years, much like washing your car. For early generation composite decking (Trex Accents), periodic cleaning with a deck wash is required. Trex high-performance decking (Trex Transcend, Trex Enhance and Trex Select) require less work - a simple soap and water cleaning is all that is necessary to maintain the beauty of the products. Newer-generation Trex decking holds strong against potential damage. All of our decking lines are scratch resistant, protecting your space against nicks, cracks and splitting. A pressure washer with no greater than 3100 psi that has a fan attachment/adjustment and soap dispenser may be used to remove dirt, concrete dust, or other types of construction dirt. Spray deck with soap, and then follow by gently scrubbing each deck board with a soft bristle brush. Spray/rinse each individual deck board using fan tip no closer than 8" from the decking surface. RINSE THOROUGHLY. If dirty or hard water containing minerals is used for cleaning, a film-like surface may appear in spots after drying. Generally, these spots can be cleaned with white vinegar or a deck brightener product. On railing, they can be cleaned with Magic Eraser® or white vinegar. Refer to our Care & Cleaning Guide for more information on upkeep and warranties. For color transfer issues (color transfer can happen when baluster spacers rub against balusters during installation), use Mr. Clean®, Magic Eraser® Original or Magic Eraser® Extra Power for spot removal. For small surface scratches, marks or scuffs, try Plexus® Plastic Cleaner. Never use acetone or other solvents on Transcend or Select railing. Can I install Trex® DeckLighting™ on my own? Trex DeckLighting is easy to install, and even easier to enjoy. Our plug-and-play setup is one of the most intuitive and simple lighting systems on the market. Refer to this video for the basics, and if you have any questions feel free to give us a call. We're happy to help you add lighting to your new (or existing) deck. What are Trex Spiral Stairs? What measurements do I need to order a spiral stair kit? Are there special building code requirements to consider when installing a spiral stair kit? Are there any special spiral stair kit ordering considerations you need to make for children or pets? How long does assembly take? Do I need a contractor to help me install my spiral stair kit? I want to paint my galvanized spiral stairs a custom color. Should I paint them before or after assembly? What if I lose my installation manual? What if my building department or inspector asks for an ICBO number? You will need to measure the exact height within .25" between the landing area and the top of the deck, including the width of the decking to ensure that your stairs end on the correct side. Many areas follow BOCA or UBC codes or variations of the BOCA or UBC codes. All Trex Spiral Stair products pass BOCA/UBC code requirements. We recommend that you contact your local building inspector to find out what code applies to your area and how that code is interpreted. For small children and pets, our code stair kits come standard with in-between spindles, which provide less than a 4" spacing between verticals. In addition, you may want to use a gate at the top of the stair. Installing a stair kit is a two-person job. For the typical do-it-yourselfer, the stairs can be installed without the help of a contractor. However, we do recommend that everyone (experienced or inexperienced) consult a qualified contractor. The contractor can help identify whether any additional structural support is necessary and required, and he or she can reroute pipes and electric lines. For two do-it-yourselfers, the spiral stairs can be assembled in about 6-8 hours. For all stair kits, you need basic hand tools and an electric drill. Before installing, we strongly recommend that you read the entire installation manual. Galvanized stairs must weather before painting. Once weathered, contact your local paint store for the appropriate primer and paint for something that has been galvanized. If you run into a problem, call Trex Spiral Stairs at 877-488-1906. Our kits are guaranteed for 25 years from date of purchase. A PDF of our installation manual is available at trexspiralstairs.com/faqs.html. Std Plan 111 has also been adopted for City of San Diego, Calif.
Is Trex Outdoor Storage cabinetry built from Trex decking? Is the Trex Outdoor Storage color only on the surface? Are the resin doors very light? Does the resin contain any wood fibers? The doors look like they are made in sections. Are these resin sections glued together? Can the resin be painted? How do I clean the cabinets? What is the hardware made out of? Do the drawers and doors keep out rain? How do the cabinets hold up with full sun exposure? Do I need to prepare my deck for the cabinets? No. Trex Outdoor Storage is built using 3/4" white PVC boxes with the exterior doors and parts molded from a high-density resin. Both are closed cell and 100% waterproof. Yes. The exterior is a very high-quality finish that has a UV inhibitor to protect the color from fading. The resin is extremely dense and chip and scratch resistant so the finish is hard to penetrate. If a chip or scratch does happen from a hard impact, the area can easily be repaired with our touch up kit or any matching Minn Wax crayon or marker you can get at your local hardware store. Actually, the doors are built with an ultra-high density resin giving the doors extreme hardness and actually weigh more than a real cypress wood door. The PVC boxes are similar in weight to 3/4" plywood. No, the doors and all parts are 100% high density waterproof resin. All Trex Outdoor Storage doors are made with one solid mold, giving the look of a multi-piece door but with no chance of the separation you can see in real wood doors. Yes. All resin parts are painted and top coated with a product that can be easily painted over with oil or latex paint. Glazing over the paint works great as it binds to the natural grain of the product, enhancing the realistic look. No power washing necessary. The PVC interior and the exterior High Density Resin cleans up with soap and water. Interiors and Exteriors can be sprayed with a standard hose as all materials are waterproof. Trex Outdoor Storage cabinets use stainless steel 110-degree self-closing hinges and stainless steel full extension drawer guides. Stainless steel screws are used to secure cabinet boxes in addition to PVC adhesive that actually bonds the boxes together giving a product that will not ever separate. No. All cabinet boxes come assembled. A separate trim is available for our skirting insert boxes to frame out the boxes and create a finished projected side. This allows installation of brick, stackstone, and other exterior skirting coverings to neatly fit the box. Both our drawer fronts and doors fit tight to the box front that helps keep rain out. Fully exposed cabinets in high wind and heavy rain may experience some moisture getting into the cabinet, but these are extreme conditions. Our high-quality UV protection top coat will reduce fading. Resin products tested for over six years in full sun exposure have shown very little sign of fading. Only if you are using the insert cabinets that slide into your skirting. An opening with a deck must be built into the side of the skirting so the cabinets can be slid into the space. The deck cabinets are simply mounted to the wall. If used as an island, panels are available to cover the back. Island cabinets can be secured to the deck for high wind areas using our PVC blocking.